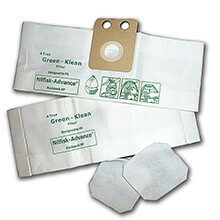 Green Klean® Filter Bags are a combination of the best bio-degradable filter medias in recyclable poly bags at reasonable prices, yet achieve optimal performance. 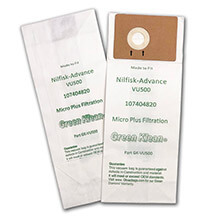 Specifically designed as replacements for OEM commercial vacuum bags, Green Klean® bag medias are independently tested and guaranteed to perform equal to, or better than the original OEM bags. 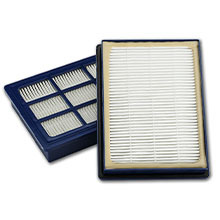 Green Klean® filters perform at efficiency levels as low as 99.9% at 1 micron. 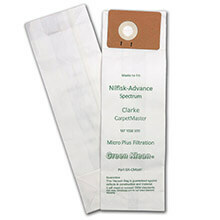 A new standard for commercial vacuum cleaner bags has been set by Green Klean®. 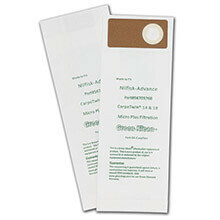 Our Micro-Plus filter medias have been independently tested by well known, qualified testing laboratories using EN and ASTM test protocol. The tests were conducted at the flow rate according to the CFM of the vacuum manufacturer. Our vacuum bags are guaranteed against defects in construction and materials, and will perform equal to, or better than the OEM.